Weather balloons have been routinely launched into the atmosphere for many years by government and commercial organisations for the purpose of scientific and meteorological observations and research. Hundreds are launched daily around the world, using predominately renewable Hydrogen as the lifting gas. These balloons invariably carrying radiosondes, a battery powered telemetry instrument package to measure various atmospheric parameters and transmit them to a ground receiver. Worldwide they operate on radio frequencies around 400MHz and 1680MHz. Last year I discovered the hobby of High Altitude Ballooning, where enthusiasts send up their own balloons loaded with experimental payloads and radio telemetry trackers using low power transmitters and amateur radio data modes and frequencies. I have since had a great deal of enjoyment receiving and decoding these as well as developing my own payload. 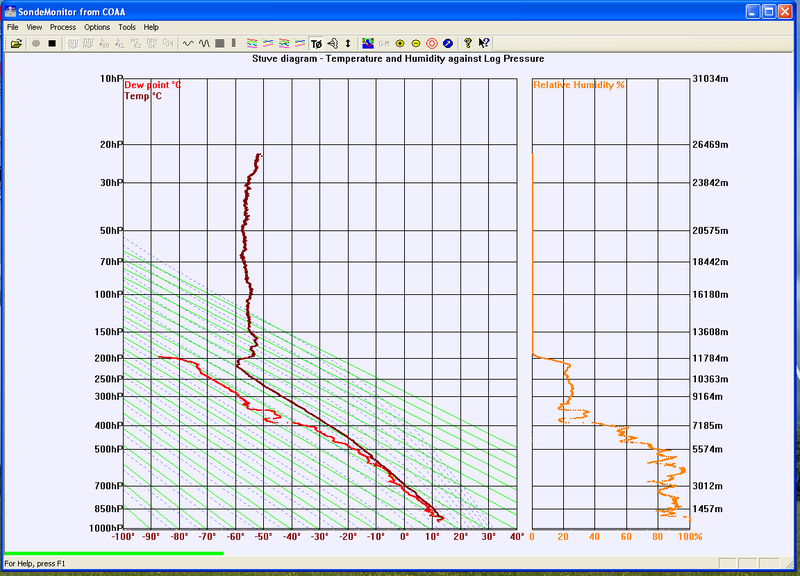 I decided last year to also try my hand at decoding the commercial radiosondes. 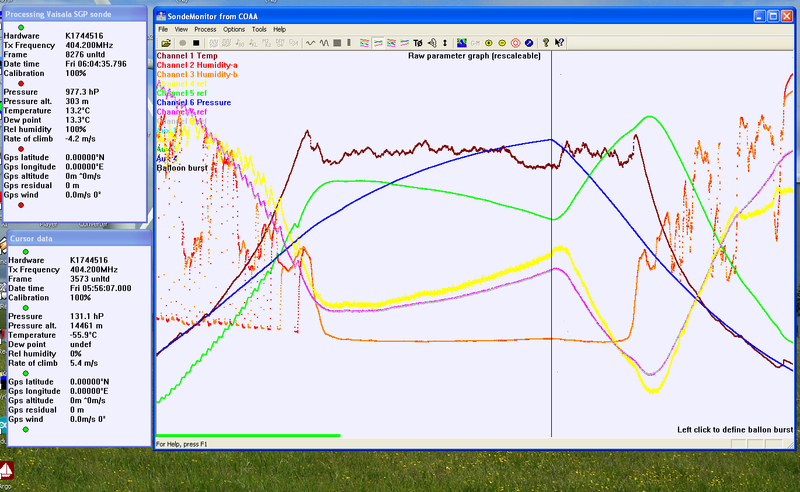 Reception of the telemetry signals is relatively straightforward as they are of higher power than the hobbyist transmitters and decoding can be done by the Sondemonitor program from COAA available to individuals to produce graphs and charts of temperature, pressure, humidity as well as the location (if transmitted) and height of balloons. The software is available for a 21 day trial but when I attempted to install it I was thwarted by a licensing issue caused I believe by installing trial versions of COAA’s ShipPlotter and PlaneSpotter programs in the past, despite this I still decided to purchase a software licence for the princely sum of €25. However this was just before the Christmas upheaval and the dismantling of my receiving set up and so it got mothballed and I have never got around to using it till now. I connected to my magical HAB antenna and using SDR# and the Sondemonitor program I received and decoded my first radiosonde early this morning and a second flight around noon. 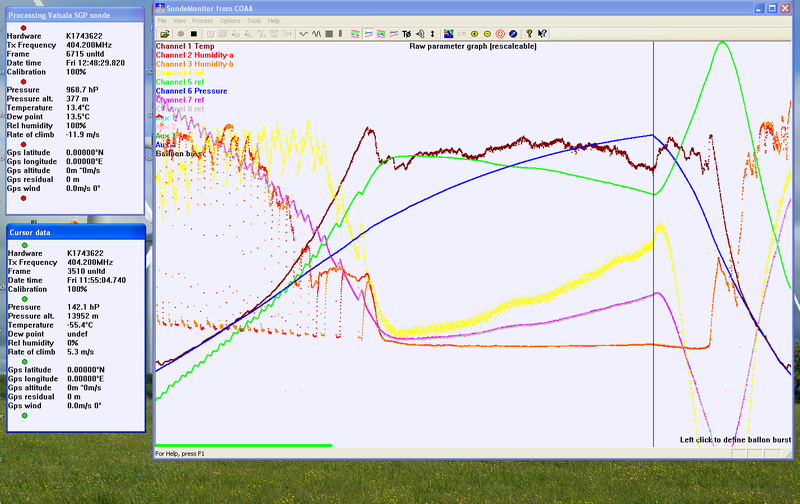 The program produces some interesting graphs showing temperature, humidity, pressure and other measurements during the ascent and after the balloon burst, as well as Tephigrams. I am not sure where these balloons are launched from. The Radiosondes are identified by the software as Vaisala SGP models (but have no GPS data?) Checking the Vaisala website there are a number of devices and one downloadable document is a comparison of the Vaisala Radiosondes made by the UK Meteorological Office in 2013 (pdf file) which mentions a site in Camborne in Cornwall, but I have also seen mention elsewhere of a site in Larkhill on Salisbury Plain. The Met Office document also hints that the Radiosonde currently used by them is one of the Vaisala RS92 range, indeed the RS92-D appears to be a device which has no on board GPS and would fit with the GPSless decodes I have made. Definitely another interesting radio diversion and if you are interested then reception can be made using RTL-SDR receivers as this tutorial on RTL-SDR.com demonstrates, but bear in mind the demonstration/tutorial shows GPS information being received which I have not seen on either of the two launches.